Last week I spent four days at Exponential East hosted by Idlewild Baptist Church in Lutz, FL. Exponential is a movement of reproducing churches envisioned by Dave Ferguson, lead pastor of Community in Chicago. This was my first time participating in the conference and I plan to return in 2016. I left the place with a notebook full of takeaways. Here is my list of the BEST and WORST from Exponential East 2015. WORST – Realizing how un-cool I really am. Maybe it is the shape of my head or the shape of my face, but there is nothing about me that can pull off the whole “I’m wearing a toboggan in Florida in late April” thing and make it look awesome. Scanning the crowd I realized that I was one of only a handful of people who did not have facial hair or a forearm full of tattoos. As a matter of fact, I think I saw the other ten clean shaven, tat-less preachers at the Jacksonville pastor’s conference in January. Hey fellas, next year let’s sit together and exchange Ike Reinhard tapes. I am so 41, suburban, white guy pastor. BEST – Not coming home from Tampa with tattoos, a toboggan, or facial hair. Tattoos look like they hurt. I’m too old to get that sort of thing started. I sweat a lot, so a toboggan would only be torture. My wife loves me clean shaven – AND THAT is all that really matters (if you know what I mean)! WORST – The technical glitches during Eric Bramlett’s segments. BEST – Realizing that my church is not the only one Satan hates. Technology remains very much in the realm of Hell and the Devil messes with all of us equally well. WORST – Looking on Google maps and thinking Port Richey is not far from Lutz; only to realize once you’re there that Florida is nothing but long stretches of toll roads. Flight from Birmingham to Tampa – $250. Daily commute on toll roads – flying is cheaper. BEST – The 2 hour nap I took on Monday afternoon at the Hampton Inn in Port Richey. Great staff, great room, great price, very clean. Pastor crash – much needed. BEST – The Brazilian thing I ate for lunch on Wednesday. I’m sorry that I can’t remember the vendor, nor do I have any idea what you called it – but HEY that big wrap of meat and stuff, it was really good. WORST – Thank you Exponential for the strategically placed snack baskets in hidden corners. Your volunteer staff gave me the warm-fuzzies,,, BUT,,,, have you ever eaten a Nature Valley Oats and Honey bar? Fiber – GOOD, resulting dental bill from eating honey coated concrete – BAD. BEST – The Exponential red t-shirt volunteer staff. WORST – The Exponential red t-shirt volunteer greeter guy that kept trying to touch me – on the way in – on the way out – OF EVERY SESSION. Dude – I’m not a hugger. Slow your roll. BEST – The worship band with the mysterious violin girl – very Mumford of you all. WORST – The worship band sitting behind you on the flight home and feeling the pressure of failing to share Jesus with the obnoxious Alabama fans beside you, while also having to exercise the Fruit of the Spirit – Don’t Punch People, the worship leader is watching you and so is God. BEST – Propaganda. Because most of my readers are probably more familiar with Bill Gaither than with hip-hop artists, allow me to explain. Propaganda is a collision of Scripture and urban plight in spoken word. In his lyrics he is harshly honest about what the church believes itself to be, what if fails to do, and what it categorically ignores about itself and the world it is called to engage. I am not cool enough to have ever downloaded any Propaganda tracks. My daughter loves him. Yet at Exponential I was glued to every word. 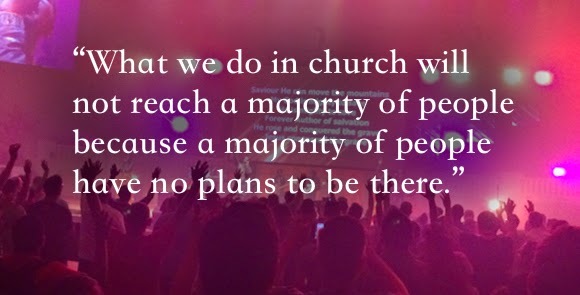 Incredibly convicting. WORST – The moments when I imagined myself before my church, on stage beneath a single smoky spotlight, without notes, wearing a torn T-shirt, bringing rhythmic, poignant, edgy spoken word to the good Baptists of Northwest Georgia. Not good. Even worse – The guy who actually tried to do that last weekend at his church. Please send YouTube link! BEST – If @prophiphop would give me a follow back on Twitter! I would get a ton of awesome pastor/dad points. (That’s @BrianBranam just in case). BEST – Multi-site workshops. This is not to say that the other workshops were not stellar, but I actually signed up for Exponential because of the multi-site workshop, so I attended nothing else workshop wise. I saw a lot of room 214 in the children’s wing. The entire conference was more than I expected, but the multi-site sessions were everything I needed. The speakers brought a great balance of content for the guys way down the path of multi-site while remaining relevant for those of us who are just entering the on-ramp. WORST – When I showed up a few minutes late to Randy Frazee’s session, he stopped what he was saying and asked, “Guy in the red shirt, who just joined us – why are you here?” Oh crap, the guy who re-wrote the Bible just called me down like a sixth grader. Me and Frazee, we’re good. He emailed me his notes. Great session. Sorry I was late. Please don’t tell on me to Max Lucado. Yay Church of Christ. He Chose the Nails, The Story, I’m a big fan. Won’t happen again. WORST – That convicting feeling you get realizing all of the things you could have done and should have done. The sense of loss in the years you did less than that for which the gospel calls. BEST – Knowing that we have a redemptive God who is sovereign in all things. He never fails.